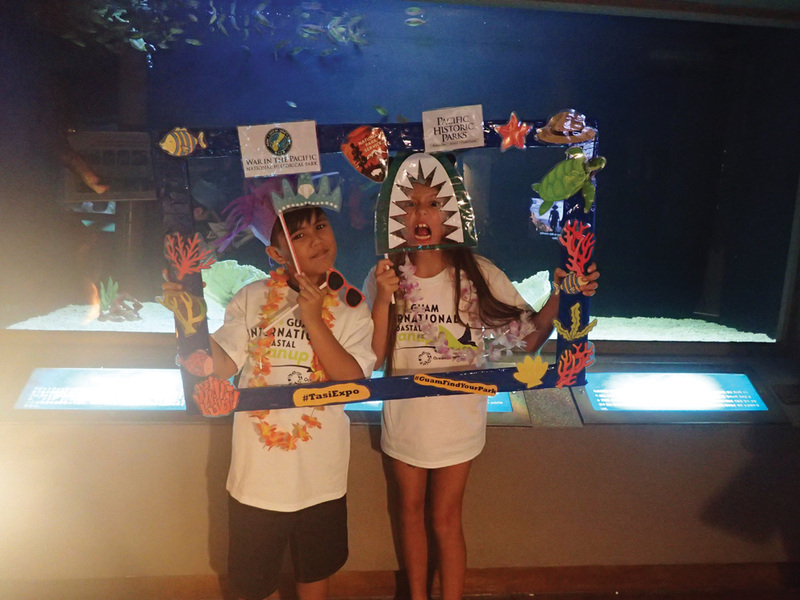 Pacific Historic Parks and the National Park Service recently won the People’s Choice Award at the first annual UnderWater World Tasi Conservation Expo, held Oct. 1. PHP Education Coordinator Kina Lewis designed and put together the entire static presentation, which included an interactive board game, a television that showcased videos at the park, a picture frame for taking selfies (pictured), park posters and photos and small giveaways. Youth Education VIPs Marijana Uchima, Tasi Petra and Pin Hsuan Chen helped Kina prepare the presentation by cutting out photos and pictures for the display. On the day of the presentation, these young ladies also stood in front of the booth to interact with the public and teach others about the park’s valuable natural resources. U.S. Dept. of the Interior Volunteer in Service to America member Lisa Aguon and her family also came out and provided support during the expo. NPS Chief of Interpretation Rose Manibusan delivered desk lamps at the last minute because the presentation area was very dark. UnderWater World will provide a monetary donation to Pacific Historic Parks for earning the most votes from the public. Last year, the winner received $1,000. Funds received this year will go toward supporting future education programs at the park.